Because Patti's TAR syndrome is indeed extremely rare: the incidence is 0.42 per 100,000 live births (see: http://en.wikipedia.org/wiki/TAR_syndrome ). However, Tap's report is not about TAR syndrome... it's about the much more common 1q21.1 deletion syndrome: which includes e.g. deletions in various regions of the 1q21.1 region, and one of those regions is the same region that is involved in TAR syndrome. "Due to this research it became clear that 20 out of 1000 autism patients have 1q21.1 deletion syndrome"
And because autism is also known for a higher occurence of 'hypermobility', there could also be a link between autism & 'extra transverse digital creases'... possibly via fragile-X syndrome. I agree Stalin "There is no least absolute can be seen from this kind of diagnostic ideas." Martijn, you are right. 2 totalty different topics. The wikipedia link for 1q21.1 deletion syndrome does state " is a rare aberration of chromosome 1"
... Unless when starts considering the neceassary combinations! Just would like to make some statements on such diagnostic grounds. There is no least absolute can be seen from this kind of diagnostic ideas. This diagnostic values are just equal to how the author of novel give name to the characters of his story. The sad part of diagnosis is that it has the majority of exceptionals. ie., all simian crease individuals are not having genetic disorder -down's syndrome. Typically hand deformities relate to some sort of altered development at a particular stage of embryology. Knowing when and how these particular features develop is also helpful. When the digits form, the distal interphalangeal joint forms before the middle interphalangeal joint forms. For a short time there is a long soft pre-bone tissue or cartilage between the metacarpophalangeal and the distal interphalangeal joint. In my opinion, these extra creases form during this time when the finger is moving and the joint is not yet there. I have read that this is the only joint in the body that doesn't form in sequence. But that page also reports the 2% in autism... and because autism is seen in about 0.2% of people worldwide... the 1q21.1 deletion syndrome is seen in AT LEAST 4 per 100.000 live births. Patti that is really interesting ! Martijn are you saying it is rare? I need to read both pages again. Martijn are you saying it is rare? I need to read both pages again. Well Tap, both syndromes can be described as 'rare'... but while the TAR syndrome is seen in about 0.42 cases in 100.000 live births, the 1q21.1 deletion syndrome is seen about 20x more often than TAR syndrome with close to 10 cases in 100.000 live births. Anyway, let's not forget that the extra transverse is much more common... because it is seen in many populations, including e.g. : health indivuals! Thanks Martijn, your explanation makes sense now. It has no principle in both palmistry and scientific views, as these are based on probability. you could not even prove atleast 1percentage . Then how it can be applicable universally. @patti, I can submit good number of cases who has good finger joints with extra Interphalangeal crease. Again that is being unscientific. Every cell of our body, beyond metabalism, originated since we are in the womb. Hence, It is no wonder that extra phalangeal creases were present in some cases since they born or during their intra-uterine life. The thing is that what you can say from this crease from the palmistry view point. Again lot of assumption we made than to make it science. science doesnt take palmar crease for diagnostic purpose. Rather, they have made speculation with rarest and least statistic rank results. Again it is being unscientific. Hence, This studies can waste your time much. but, never can give you solution through out. Stalin, you talk about 'it'... but how can we understand what are you are trying to tell us here? I thought you were a medical student? I guess I thought wrong about that? The term modern palmist is out of existence. still, some claim themselves they are. However, your sarcasm sounds meaningless unless or until you make scientific discussion . However, we have wasted 3 pages of discussion with no use already. Yes Stalin you did annoy me with your response. Especially since I did think you said you were a medical student. Which should mean you have access to medical literature and an understanding of human anatomy. Although the developmental aspects are not important to you, that does not lessen their value to myself or others. My comment that the distal interphalangeal joint formed before the proximal interphalangeal joint is not in regards to a defect, it is the normal process of limb development. Thanks for your teaching on embryology lessons. Let me explain why i would like to leave this aspect in this forum. You try to explain the normal development of the embryo, particularly willing to trace the development of Interphalangeal joints. But, I just wonder, in what way, this relates to the extra Interphalangeal crease of the finger. I also noticed you saying that it relates . but, those statistics are minority . and could not find in all cases. That is what i explained in my previous message. secondly, you try to say that articulation take place first in distal phalanges , later the proximal phalanges. Hmm.. I could not see any palmistry related message in this one . Science is a ever-enlarging subject in a bound of limited materialistic views. we can talk about anatomy , physiology, pathology, endocrinology, embryology, genetics etc., in related to hands. but what is the use in the viewpoint of palmistry and medical science regarding this extra-crease is being the matter here. Unfortunately, this remains mysterious to science . Even, if they see through genetics, they wont relate it with character nor specific disease in all cases of it's presence. so, end result is being none all the time. this is what i am telling you in my previous posts. I used to think in terms of "they" for many years. Then I realized it isn't "they" it can be "we". Some researchers are more interested in syndromes and defects, some have a knack for data and statistics. My preference and research is relating to "why". If you study development you have little tid bits of knowledge that helps explain things. For instance, the middle ring and index fingers develop faster than the thumb and little finger. The little finger finishes up usually last. This is the finger we most often see the extra crease. There are plenty of arguments that the flexion creases are based on flexion as well as on genetics. If the little finger is bending and curling along with the more developed ring and other fingers into a little fist, but doesn't yet have a joint, I believe there is a strong reason to believe this flexing is causing creases to form where the skin tissue buckles. The genetic instructions is not for placing the joint where the crease forms, but where it actually belongs. You won't find this in any palmistry book yet, Stalin. It's my own theory, based on facts from human and limb development textbooks. Extra interphalangeal transverse creases of the little finger. Sometimes a finger has extra interphalangeal transverse creases on fingers, especially on little finger. These are quite different from the horizontal lines cutting across the fingers especially on fingertips. The Department of Urology, Faculty of Medicine, Kyoto University, Sakyo-ku, 606 Kyoto, Japan got published a report on the topic on 21 November 1977 and the Summary was this: A series of 283 male and 268 female individuals were examined for digital flexion creases on the little fingers. Two males and two females were found to have an extra interphalangeal transverse crease situated between the metacarpophalangeal and proximal interphalangeal creases. The extra crease of the little finger was unilateral or bilateral. None of the little fingers with extra crease had radiographic anomalies of the bones or joints, or evidence of dyskinesia. The single extra interphalangeal transverse creases of the little finger or any other finger represents as generally recognized, a characteristic dermatoglyphics trait in Down’s syndrome. There is a dearth of detailed information of cases with an extra interphalangeal transverse digital crease on the little finger in addition to the usual three digital creases. However, a connection with extra interphalangeal transverse creases is linked with Larsen Syndrome; that is a very rare congenial disorder- the sickle cell disease- which means deficiency in red blood cells. The extra crease on the little finger is likely not associated with any medical problem because usually it is not accompanied with an abnormal hand bone structure, so in far most 'extra crease' cases there is no 'extra' phalange. The person does not feel difficulty or abnormality in performing voluntary muscular movements. 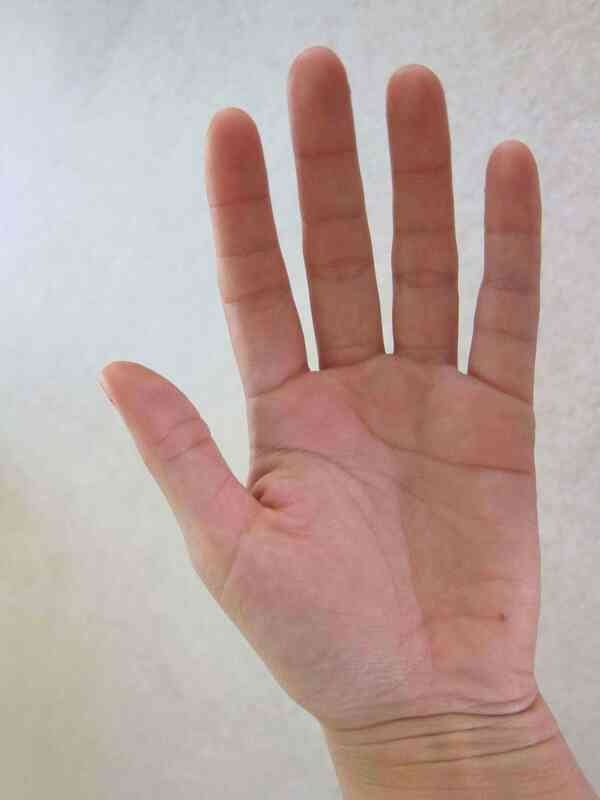 In general, an extra crease is most often found at the fifth finger - but no more than in 1% of the total population. In the fields of modern hand analysis i.e. palmistry, there is no commonly accepted theory about the meaning of this ‘unusual’ hand characteristic so far. In my experience camptodactyly is a medical condition involving fixed flexion deformity of the interphalangeal joints of the little finger. This involves permanent flexion of one or more phalanges of fingers. That means a psychiatric disorder marked by deficits in communication and social interaction in childhood. The term is sometimes applied, more loosely, to adults who are extremely self-absorbed and who see things in terms of their hopes and fantasies rather than realistically. I also have a 4th phalange crease in my pinky but I alsi have it in all my other fingers in my left hand. I have never met another person with this oddity. Any ideas what this means? First of all: welcome at this forum, and thank you for joining the discussions! My first association with these 'extra interphalangeal transverse creases' would be... do you have hyperflexible body- or finger joints? Or maybe a medical/body problem which could related to that? PS. Yes, having those lines on all fingers is quite rare indeed. no, I don't have hyperflexible body or finger joints. I don't have any mobility problems, but I'm quite good at math and logic... if that makes a difference. vanessatjd wrote: no, I don't have hyperflexible body or finger joints. I don't have any mobility problems, but I'm quite good at math and logic... if that makes a difference. Okay Vanessa, thanks for your feedback. Then I am wondering... are you aware if any family members have any those lines as well? Point number 4 applies in your case. Please check the Shadbala of the planets that have extra phalange. In my case, I found that the fingers with the extra phalanges had the highest shadbala (a sign of strength-but does not necessarily mean only good-since one has to look at many indicators in astrology) in the natal chart. But I do agree that Science has not given us a clear picture of this syndrome. Most ppl who have this seem to be very normal with their physique. Science/medical link is only 1 one of the points mentioned in this list. People should be open about exploring everything else too. PS. Regarding the last point in your list, Down syndrome is typically featured with features that can be described as 'compressed' manifestations of underdevelopment (seen in both the palm + the fingers). This explains why sometimes one can see only one 'interphalangeal crease' on the pinky finger (usually combined with a short 2nd phalange). This also explains an why an EXTRA-phalange is not seen in Down syndrome (because that would indicate 'advanced' development - which is not characteristic for the trisomy 21 disorder). Thank you Martin for the correction on the last point. You are the expert for this particular area. Hence I agree with you on this.